When they run to the closet and emerge with this picture book, I begin shifting around nervously. I look at my watch. Wow, is it really that late? Wouldn't you rather hear Meet Strawberry Shortcake again? How about Good Night Moon? In my head, I'm begging. I'm pleading. Anything, but that book. You see, I can't get through that book without collapsing into a bawling, emotional mess. 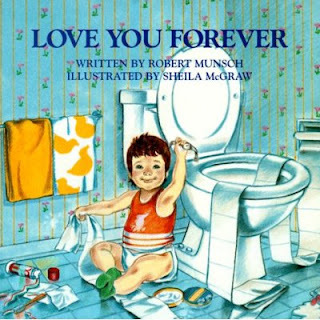 When I first read Love You Forever, I was pregnant with my first. My sister-in-law sent it as an early baby gift. She enclosed no word of warning. No box of tissues. And so, in my hormonal pregnant state, I cheerily sat down and started to read. By the last page, I was so distraught my husband thought something truly terrible had happened. That's touching enough, but here's the real clincher: eventually the mother gets old and the boy does the rocking and singing. Then he drives home and sings to his own baby. Oh, I'm tearing up right now just thinking of it! After my initial reading, I purposely hid shelved the book. When my daughter was about two, she discovered it. As she handed the book to me, I took a deep breath and tried to convince myself that it would be okay this time around. Now that I was familiar with the story, I could surely steel myself against the emotional onslaught. But, by page eight, my voice began trembling. By page 12, the floodgates had opened. Again. I'm not the weepy type. I pride myself on never crying during movies. But I am powerless in the presence of this book. And while my summary makes it sound a little cheese ball, I'm telling you, this book can make even a grown man weak in the knees. A few weeks ago, my husband came into the kitchen after tucking my son into bed. "Thanks for the warning," he said. "The book. You could have warned me about that book. I was crying like a baby." No futher explanation needed. I knew exactly what book he was referring to. I was just glad to know that I wasn't the only one. When I was in Sunday school teacher training the facilitator read this book aloud to us. Picture a whole room full of adult men and women sobbing. Someone gave it to us when the kids were small. I can never get through it without tears either. I feel exactly the same way! That book just does me in! brings me to tears every time. You're *so* not the only one. I love that story. I've taken to repeating the phrase to the two of my children who haven't become too "mature" to hear it every night as I tuck them into bed. I almost didn't read this post when I saw the picture! But I pulled myself up by my sandal straps and forged ahead! I have hid the book. I actually have a copy for each of my children so that I can pass on the legacy of weepy reading! I absolutely love this book. I bought it when I was pregnant for my daughter and then again with my son. I'm with everyone else. I have literally had to close the book in the middle to stop myself from just bawling. I'm so glad to see I'm not the only sap. I have read that book and purposely don't own it because it just wrecks me. My weepy book is "God Gave Us You" by Lisa Tawn Bergren. I read it for the first time when pregnant with my first. It's right up there with that song "He's My Son" by Mark Schultz. Ugh. I like your description "powerless". That's it exactly! You are definitely not the only one! While I don't have a child yet to read it to, it's a book my Momma read to me a lot, and I think I even read it to my bunny or puppy on occasion as a little girl...it's a precious, albeit tearjerker, book! I haven't read that one- not sure that I could make it all the way to the end. Mine is The Giving Tree- I cannot make it to the end without the flood gates opening. OK, I like this book, and I made up a tune for the song that my daughter likes to sing, too! :) But am I the only one who thinks it's too much and too scary for little ones?? Maybe because my 2 1/2-year-old is very sensitive, but I skip a lot of the parts about the mother getting old and she can't finish the song. I just say "he called his mommy and she said 'Come over and see me!' so he went to her house" ! :) I think this is actually a nice gift to give to an adult child! I cannot read that book. I'm with you - I tend not to like to bawl while reading to my kid before bed! I told my husband he will have to read that one to the kids.